Meetings are the glue that holds early childhood organisations together. 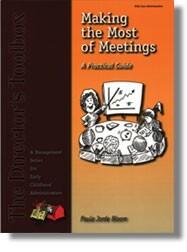 Whether it's a weekly staff meeting, a monthly parent meeting, or an annual board meeting, directors rely on meetings as the primary vehicle for communicating information, identifying and solving problems, and making new decisions and modifying old ones. There is no avoiding it, skill in facilitating meetings is essential for effective program management. This book is filled with practical tips and techniques to help you reverse the slump you may be experiencing in meeting effectiveness. You'll learn how to accomplish more work in less time and have more fun in the process.